2018 Ducati Hypermotard 939 SP. Picture credits - Ducati. Submit more pictures. With the Hypermotard 939 there�s no need for a pristine road, a prestigious racetrack or a remote exotic destination. Thanks to its agility and the combination of the 110 hp of the Testastretta 11� engine and Riding Mode technology, the Hypermotard 939 is perfect for any style and riding condition. Driveline: Chain, Front sprocket 15, Rear sprocket 45. Primary drive: Straight cut gears, Ratio 1.85. Exhaust system: Single stainless steel muffler with catalytic converter and two lambda probes. Wheels: 3-spoke forged light alloy. Pirelli Diablo Supercorsa tyres. Instruments: Multifunction digital dashboard with white backlight, composed of LCD segments for rev counter and a Dot-Matrix area for all other information. Ask questions Join the 18 Ducati Hypermotard 939 SP discussion group or the general Ducati discussion group. Bikez.biz has an efficient motorcycle classifieds. Ads are free. Click here to sell a used 2018 Ducati Hypermotard 939 SP or advertise any other MC for sale. 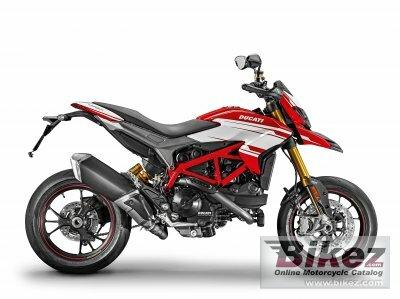 You can list all 2018 Ducati Hypermotard 939 SP available and also sign up for e-mail notification when such bikes are advertised in the future. Bikez has a high number of users looking for used bikes. Before you buy this bike, you should view the list of related motorbikes Compare technical specs. Look at photos. And check out the rating of the bike's engine performance, repair costs, etc.